When it comes to health and wellness in pregnancy, any choice an expectant mom makes is for two (or more! )—including whether to receive vaccines. During National Immunization Awareness Month, we’re taking the opportunity to educate our patients and all pregnant women on this critical area of their care. As with any medical treatment, recommendations around vaccinations center on risk vs. benefit. In general, a vaccine that contains inactive viruses is safe in pregnancy, and its protective benefits almost always outweigh its risk. The flu shot and the Tdap vaccine—which prevents against tetanus, diphtheria and pertussis (whooping cough)—are primary examples of vaccines that contain no live viruses. Not only do these vaccines protect both mother and fetus from potentially serious infections, but the baby will then retain some of that immunity after birth. For these reasons, we routinely recommend that women receive the flu shot and the Tdap vaccine during pregnancy. That having been said, it’s important to note that only the flu shot—not the nasal mist—is recommended in pregnancy, as the nasal mist is made from a live virus. Other common vaccines that contain live viruses include the chickenpox (varicella), measles-mumps-rubella (MMR) and shingles (varicella zoster) vaccines. Since it’s possible a live virus vaccine, while generally safe for children and infants, could pose a risk to the baby, pregnant women should avoid these vaccines. Health care providers may recommend other vaccines during pregnancy in certain cases, such as upcoming travel outside of the U.S. 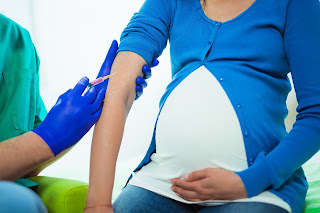 If a mom is at higher risk for infection due to certain health factors, we may determine that hepatitis A and hepatitis B vaccines would be beneficial. It’s the job of your obstetric provider to explain the risks and benefits of receiving any vaccine, and to make recommendations based on your particular situation. Call us with any questions or to make an appointment. We can help you make the best choices for your baby’s health and yours.